Functional immobilized biocatalysts may be taken to be immobilized biocatalyst systems with some beneficial functional capability other than the usually credited advantages obtained upon the immobilization of enzymes or microorganisms within appropriate polymers. This review aims to examine the preparation of functional immobilized biocatalysts using stimulus-sensitive polymer gels (SSPGs) that undergo continuous or discontinuous volume collapse in response to alterations in external stimuli. The use of SSPGs offers the following functional capabilities in immobilized preparations: (1) the enhancement of immobilized enzyme activity via the cyclic absorption of substrate solutions; (2) the control of immobilized enzyme reactions, especially their initiation and termination, using changes in temperature; and (3) the conversion of the energy of an immobilized enzyme reaction into mechanical work through discontinuous changes in gel volume. 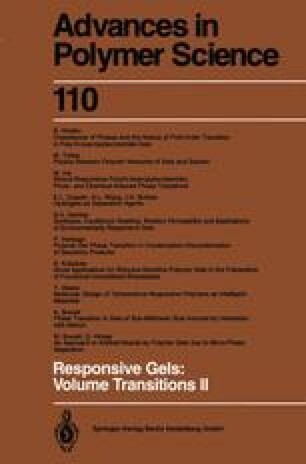 It has become apparent that all of these functions demonstrated by the immobilized preparations obtained rely on the characteristics of specially designed SSPGs: a lightly cross-linked copolymer gel consisting of N-isopropylacrylamide and acrylamide, the thermally controlled swelling/deswelling of which absorbs the substrate to facilitate its diffusion through the gel porosity; a thermosensitive gel consisting of poly(vinyl methyl ether) which is capable of dramatically reducing substrate diffusion above the phase transition temperature; and a polyelectrolyte gel which undergoes volume changes enzymatically at a certain temperature. In conclusion, the ideas or concepts reviewed here could play a part in the design and construction of functional immobilized biocatalysts.